Making their West End debuts are the original Broadway stars; reprising her Tony Award-winning performance as ‘Broadway musical’s undisputed Queen’ (The Sunday Times), Kelli O’Hara (Anna), Tony and Oscar nominee Ken Watanabe (The King). With one of the finest scores ever written including; Whistle a Happy Tune, Getting to Know You and Shall We Dance. Featuring a company of over 50 world-class performers, The King and I is a testament to the lavish heritage of gloriously romantic musical theatre. 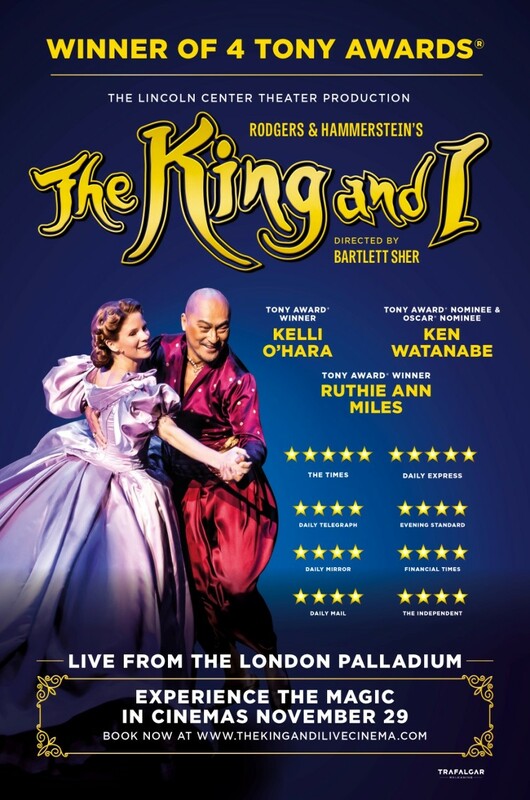 After the huge success of the Lincoln Center Theater's production of Rodgers and Hammerstein's The King and I, the production extended its engagement for a final three weeks at London's iconic Palladium, where this cinema broadcast was filmed. You should book early for this showing, as we expect a large take up. Check out what pre-theatre delights are to be offered.